The second day of the 7th edition of NLIU-INADR ILSMT took place on 24 November 2018 and began with anxious participants preparing for the preliminary rounds. While teams huddled together revising their strategies, the judges were briefed about the simulated legal issues by none other than Case Ellis. Ellis, who is affiliated with INADR, deliberated and discussed the possible mechanisms by which teams could manoeuvre the negotiations to their advantage. The distribution of the confidential information to the participants took the already-tense environment of the competition up a notch. As participants and judges settled in their respective seats, the first set of the preliminary rounds began. 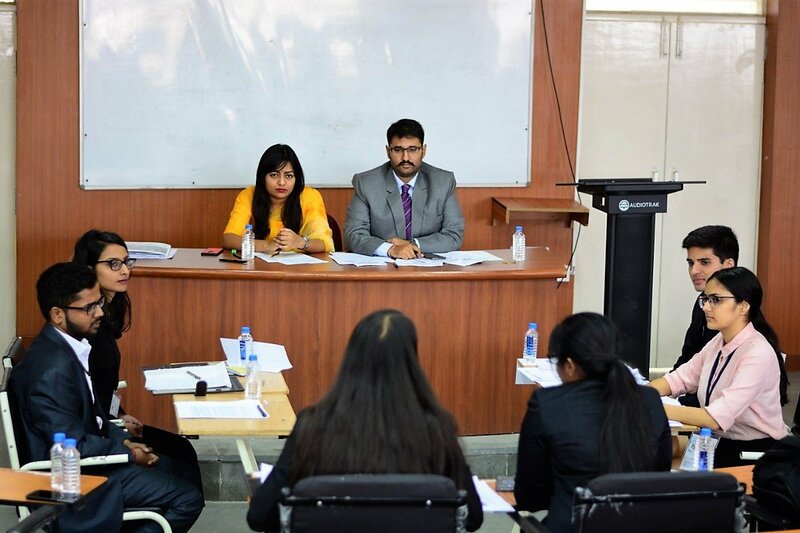 Each round was followed by a mandatory 15 minute feedback session conducted by the judges to provide a comprehensive analysis of the participants’ performance. The judges highlighted the possible techniques, body language, and mannerisms the teams could adopt to hone their negotiation skills. Appreciative of the constructive criticism, the participants walked out of their sessions with a better, newly found understanding for this practice. According to the judges, even though the stakes were very high, the participants did not let their inexperience reflect in their performance, proceeding through their rounds with a calmness and confidence that can only be acquired after years of mediation experience. The judges were impressed and satisfied with the manner in which teams circumvented conflict to arrive at an amicable solution for the array of legal issues detailed in their fact-sheets. The NLIU ISLMT legal disputes were crafted by the best in the mediation field who poured over each detail, refining it to the best of their capabilities. While the first dispute forced the teams to grapple with a disgruntled homeowner and a mansion which was rumoured to be haunted by the ghosts of the previous owners, the second dispute appealed to conservationists as it involved a sloth sanctuary and its allegedly abusive owners. After the first set of preliminary rounds, the judges and participants dispersed to rejuvenate themselves for a well-deserved lunch break. In the late afternoon, round two of the competition commenced. To lift the spirits of the participants and judges after an exhausting second day, a cultural night equipped with Indian food and music was organised to allow for social interaction and networking. Under a canopy of shimmering lights, the second day of the NLIU-INADR ILSMT ended on an excellent note and one step closer to rediscovering mediation.